Did you know that every single one of us is called by God to do something? And, no, before you can even wonder what that means for you personally, it doesn't mean that you have to give everything you own away and jump on a plane to Africa. Most of us are not called to do something that will change the world as we know it: we are simply called to have positive impact on our own little corner of it. This is not something you have to stress about because God has already made the big impact by giving us Jesus. Over the past decade I have come to realize that I will neither save the world nor is it my job to do so. God is the only one who can and will save us. My job is to live the best life I can according to who I believe Jesus created me to be. For me that means being a wife and mom. For you, this could mean being a teacher, a stockbroker, a carpenter, or a data entry clerk. God has given each of us gifts and talents and utilizing these gifts with integrity and character is not easy - it is a real "calling". It means not turning away when someone needs something and it is not convenient monetarily or time-wise. It means having integrity in your dealings at work in all things, including office gossip, business deals, etc. For me, personally, it means being patient with my son when I am exhausted from mothering and giving my husband my full attention and time at the end of the day when I might rather be alone with a book. It also means committing to pray for them and how I treat them throughout the day. Whatever job you do, you are called to do it in a godly manner with the gifts and talents that God has given you because God has called all of us to live this life for Him. I can honestly say that my wife and I have moved from being married and just roommates to being married and engaging in a blessed partnership. Fortunately, or unfortunately, we arrived at this point only after experiencing our share of peaks and valleys (probably more valleys than peaks). After extensive reading and talking and then more talking and reading...and praying, we decided that we wanted to compile some helpful resources that could be incorporated into a group format for married couples (more on that to come). 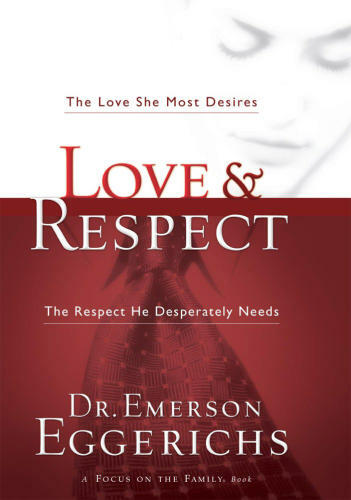 One of the sources that we are utilizing is Dr. Emerson Eggerichs' book "Love & Respect." Its a really cool book with its length mitigated by its ease to read and humorous stories. As you delve deeper into the book, you will realize that the contents is not rocket science and you will probably either find yourself saying "DUH!!!" or "This nonsense does not work because I have already tried it!!!!" Please be patient. The strength of this book lies in its ability to encourage couples to navigate its pages TOGETHER. The author divides the book into sections that pertain to the couple, sections that pertain to only the husband, and sections that pertain only to the wife. The author's suggestion (and I agree) is that you and your partner should read everything. So now that you have had a brief introduction, let me give you a small taste. Dr. Emeson uses the acronym C-O-U-P-L-E to illustrate how a husband can demonstrate love to his wife. "Your wife will feel loved when you move toward her and let her know that you want to be close with a look touch, or smile." "She wants to talk about things. She wants to have her problems out in the open for discussion in order to solve them." "Your wife is vulnerable to you in at least two areas: (1) when you say things such as 'I just don't understand you...I wonder if it's worth it to try?' and (2) when you dishonor her by treating her less than an equal..."
"Without peace in you relationship, she [your wife] doesn't feel close, she doesn't feel you're open, and she certainly does not think that you are understanding." "A woman always likes to hear her husband exclaim 'You alone are my love'." "God has made women so that they want to be esteemed, honored, and respected. The way to honor your wife, as well as to honor you covenant with God, is to treasure her." We believe "Jesus changes everything". When God became a human man named Jesus who would sacrifice himself to save every one of us, a life changing event took place for us all. How many of you would die for someone? I know that I would give my life for my son or my husband but if you put me in a position to save a serial killer or even just someone I didn't like very much, my answer would most likely change. Most of us operate based on a system of credits and debits. We have to earn each other's trust. We have to earn our position in society. We have to earn our position at our workplace. Even within our own families we jockey for position based on what we have or have not done. Most families, whether you want to admit it or not, have the "good child" and the "troubled or difficult child". When we are so used to having to earn our way through life it is hard to understand that Jesus simply offers us grace and forgiveness for free. Jesus doesn't care what we have done, who we have hurt, or what we are ashamed of - at least not in a way that ranks us or compares us to others. To Jesus, we are all His children and we have all so totally screwed up there is no way back unless He makes that way for us. Jesus gave us that way back by dying for us on the cross. When Jesus died the agonizing death of the crucifixion, He took all of our shortcomings, mistakes, failings, sins - whatever you want to call them - upon himself so that in the eyes of God, we are perfect. We do not have to do anything to earn God's love and mercy, we simply have to believe. When we can stand in the position of understanding that we are truly forgiven and made new, we can be transformed. We can drop all the baggage from our past that weighs us down and keeps us from making better choices in our future. We can love others without needing them to love us back because God gives us more love than we can comprehend. When we believe that Jesus truly cares for us and took all of our sins upon Himself that we might have eternal life, everything changes. Now, that sentence had a way of freaking me out a little so I immediately started googling the words "NASA and end of world". The first hit was a headline that said exactly what my sister had told me she heard on the radio. Lucky for me, before I could really get myself all worked up, I noticed that the newspaper it came from was the Weekly World Inquistor. Not exactly the New York Times, folks. Just below the link to the Weekly World Inquisitor was one to NASA which assures the public that the world is not going to end in 2012. In fact, NASA scientist David Morrison (Ames Research Center, Moffet Field, CA) has been pretty outspoken about all the 2012 end of the world fears. He says that many people tell him how scared their families are (adults and children) and that some people tell him they are thinking about committing suicide to avoid experiencing a catclysmic event. He goes on to say that "It is a sad testimonial that you need NASA to tell you that the world is not going to end." Now just in case you need to read these articles for yourself, here are the links: www.trendsupdates.com/tag/solar-flare-to-burn-earth ; www.nasa.gov/topics/earth/features/2012.html ; (and if you need a good laugh) www.weeklyworldinquisitor.com/NASA-predicts-end-of-world.html . As I was thinking about how quickly I, too, had started to panic at the news that NASA might have actually predicted the end of the world, I started to feel a little ashamed. Our desire to continue to live on earth and enjoy the "good life" is really just a symptom of our brokenness. Even if solar flares wiped out the earth in a blaze of tremendous size, we have nothing to be afraid of because we belong to Jesus and we are going to a much better place when we die. Whatever pain or suffering we experience here on earth, is nothing compared to the JOY we will have upon arriving at our eternal home. The first 3 verses of Psalm 46 states, "God is our refuge and strength, and ever present help in trouble. Therefore we will not fear, though the earth give way and the mountains fall into the heart of the sea, though its waters roar and foam and the mountains quake with their surging." I think there is a reason that is read often at funerals. We need to be reminded that this earth is God's earth. That we are God's children. God may not give us a happy ending in the short term but He will give us one in the long term if we are willing to call upon His name in faith.
" ' Be still and know that I am God; I will be exalted among the nations, I will be exalted in the earth.' The Lord Almighty is with us; the God of Jacob is our fortress." - Psalm 46: 10-11.